Blue Velvet! It's oh so yummy, even though it's a test cake. 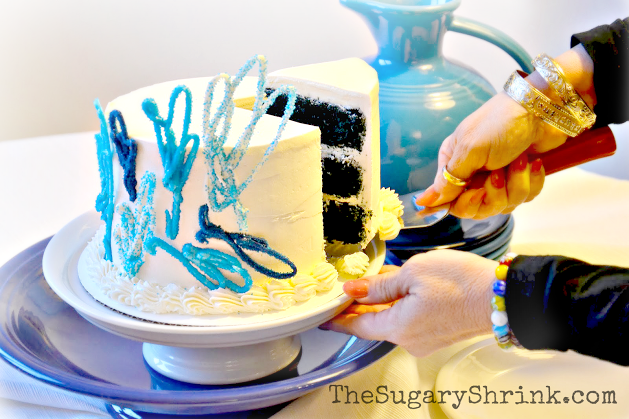 First, Blue Velvet is the same as Red Velvet except for the color. 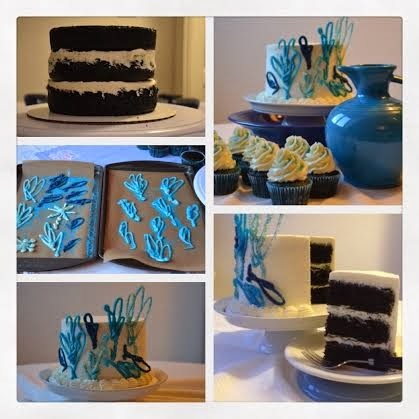 Last summer, I tried a specific Blue Velvet recipe - it was an epic fail. I decided to try again by using my tried and true Red Velvet recipe. The guess work came in trying to figure out how much coloring to add. I followed the recipe and added 3T coloring...it was too much. The results of this cake is a bit dark since it's a difficult to recognize the blue tint. Next time, I'll add just 2.5T of blue coloring...and go from there. I was stuck in figuring out how to decorate this cake. I texted our oldest daughter, Marie, and her suggestion was "modern, edgy." Umm.. what does that look like? I melted the candy melts, piped a free-form shape, and sprinkled with blue sugar. Piped swirls are in white, light blue, and dark blue - same blue sprinkles for each one. I'm not sure I hit modern or edgy...but I know I like this look. It makes me think. And, it's a good jumping off place for working with candy melts and sprinkles. The cake stand is gently resting in a vintage Fiesta Ware Compote in Cobalt. The Fiesta Carafe is Peacock; I think both colors are somewhere in the sugar. This cake was baked since we had plans for a dinner date with friends. Interestingly, when we dine at one of our favorite restaurants (The Goldener Hecht), we take cupcakes for the amazing staff. It kinda became a thing. Anyway, the cake had good reviews and there was a request for seconds! Baking and decorating cakes stretches my creativity. I'm so grateful that I get to try new things in the kitchen...including the freedom to make mistakes or hit a wrong note. 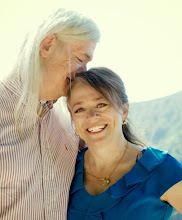 I love that I get to choose all that is good in my life... my life partner, children, sobriety, education, etc. Thanks Smaug! I plan to make this cake more often...and perhaps add fresh blueberries into the cream cheese filling or as a decoration. Thanks for reading. I think you NAILED modern and edgy. I absolutely love the cake. I never would have thought of doing candy melts and piping them into shapes, I'm definitely bookmarking this one. Esther -Thanks! I really appreciate the feedback. I love playing with candy melts...try starting with a dark outline of what you want your design to be...then place it under waxed paper. Then it's like outlining with the candy. I need more practice, but that's ok too.